Beyond the boat deck, what things to do in Halong Bay are perfect for adventurous travelers? We caught up with our rock climbing and kayaking specialists at Vietnamese Private Tours to answer those questions. How’d you end up in Halong Bay? I have been working in Tourism for close to ten years now. I came to Vietnam on 2009 since Vietnam was high on my list. Cat Ba Island is by far my favorite place, thanks to its diverse culture and incredible adventure opportunities. What makes Halong Bay a great place for adventure seekers? Its the eerie mist that can sometimes creep through the bay swallowing the limestone cliffs, painting a picture that is a cross between Jurassic Park and Lord of The Rings. The 400+ islands make any person become an adventurer, be it by kayak, stand up paddle board or climbing high to get panoramic views of Halong Bay. This place has got what any adventurer needs to keep them happy! For adventurous travellers, what things to do in Halong Bay are a must? The best way to get out and really experience the bay is by kayak. When you’re at the foot of a huge 100+ foot tower of rock, you really are blown away. 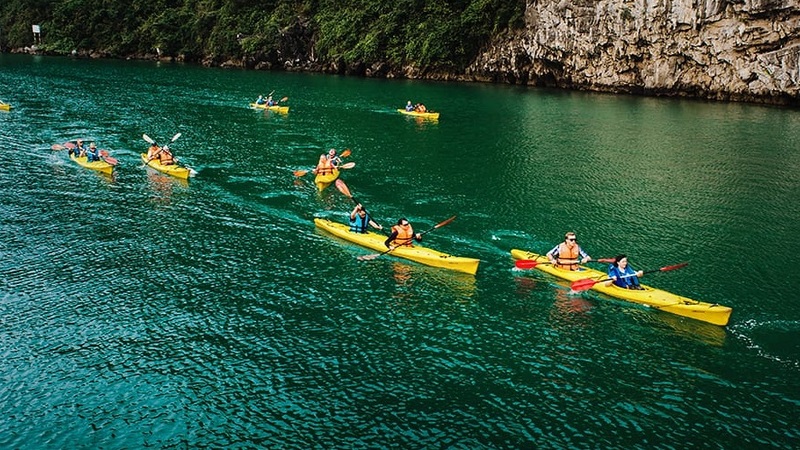 Kayaking through caves that open into huge lagoons with the possibility of seeing native monkeys and even eagles fishing for lunch is a must do in Halong. 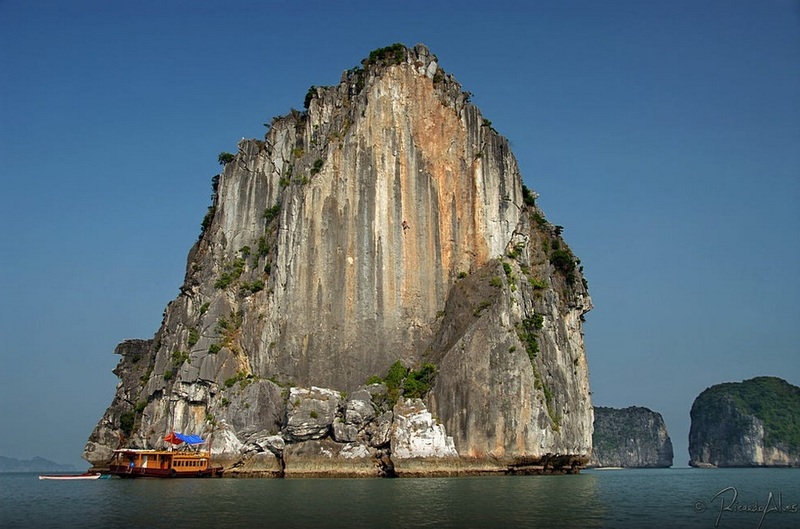 For the best views, rock climbing is by far the best activity for adventure seekers in Halong Bay. It means a bit of elbow grease and conquering of your fear of heights, but the views alone are worth the effort ten-fold. We always use qualified and insured guides, so this is a safe and fun way to face a fear or follow a love. Though lots of people dont even know it can be done in Halong, stand-up paddle boarding is an incredible way to get around, too. Cruising through arches or solid rock only hearing the water drip from your paddle is a very special, very surreal experience that is great for adventure travel novices. But, as I have said, the ultimate adventure seeker activity is deep water soloing. This form of climbing is not for the faint-of-heart. This means climbing high above the water on some of the limestone faces but with no ropes! This high-adrenaline activity is a must if you’ve got a bit of climbing experience. Like always, we use qualified guides and boat crew that have been sailing these waters for their entire lives. Last but not least, trekking in and around Cat Ba is beautiful, with a wide range of distances and ability levels. This is something nearly every one of every fitness level can enjoy, which makes it a great activity to try for anyone looking to try something unique off of the boats deck. What do you think is missing from most travellers experience of Halong Bay? Halong Bay is truly beautiful and anyone who does any kind of touring here will love it. That said, most of Halong Bay overnight cruise including the wooden junks visit areas that nearly every other boat goes partly because of the strict regulations around environmental protection. So some of the most beautiful spots in the bay have lots of boats and cruises anchor , which sometimes can make it hard to enjoy the beauty of the bay without feeling a bit claustrophobic. Sometimes, for those looking to experience the true beauty of the bay and the people who call it home, the cruising experience alone isn’t enough. We at Vietnamese Private tours try and craft our experiences around doing the things few others will do, and seeing the places few others will see. Obviously this requires a bit of effort and adventure, but we always find that no matter how experienced the traveller, it’s always worth it! What is the favorite place in Halong Bay? My favorite part of the bay has got to be the secret lagoon, which is a stop on our kayak tour. This journey travels by kayak through a small cave which opens into a huge lagoon. It has vines hanging onto the water with native wildlife such as Giant Squirrels, Osprey and some monkeys all living there! Its one of those places that feels as if time forgot. If you’ve got a bit of adventurous spirit in you, this extended kayak tour is really, really special and unique. What are your top five tips for adventure seekers heading to Halong Bay? First and foremost, its important to stick with a reputable tour organizer. There are lots of Halong Bay cowboys who dont put safety as a top priority and in a place like Halong Bay, thats important! The good tour operators will be happy to share their experience and qualifications, since we hold these as a point of pride. A good rule of thumb is this: you get what you pay for, so cheap doesnt always equal a good value! Secondly, I always tell visitors to pack a waterproof camera. You’ll absolutely want to take photos while you’re out in the bay, but as with all water adventures, you’re likely to get a bit wet in the process! Bring along some plastic bags or better yet, some waterproof equipment or cases to make sure your electronics survive the journey. Lastly, do your research and remember that there are experiences beyond just a cruise. If you want something a bit more challenging, go with the guys who can get you to the best-kept secrets! Proudly, an adventure travel organizer when it comes to Halong Bayy! Ask us about how to make a kayaking, rock climbing or stand-up paddle boarding experience part of your Vietnam tours with us. Well help you get off-the-beaten-track and into the heart of Halong Bay.